So I just read this amazing article about women, size and society. And it made me think about my last post. The one I shared about my dancing history. I feel I was not completely truthful in it. I chose a picture that showed me in my ‘best’ light. The version of me that society would say, “Hey, that is an attractive dancing lady.” But that photo feels like a lie. Most of my body is obscured by a veil. You see my perfectly applied makeup, my hair done with flowers just so, parts of my colorful costume and even my pricey pedicure. But you can’t see my stomach, my hips or my waist. And in an article about ‘the real me,’ I feel I did you an injustice. You see, I am not small. I am just about six feet tall. I wear a woman’s size 11 shoe. If I were to use an analogy, I would chose this one: Kristin is to petite as Mt. Kilimanjaro is to ants. Maybe not the best sentence I’ve ever written, but it’s apt. I am the absolute opposite of tiny. As I’ve grown older, I’ve gained weight. So not only am I tall, I’m also obese. Overweight. Heavy. Big-boned. Pudgy. Rotund. Stout. Fluffy. Built Like a Brick House. Fat. Medically that is. According to those fancy BMI (Body Mass Index) charts, I am definitely in the ‘obese’ category. And I’m okay with that- most of the time. I’m very tired of trying to fit into a mold. Instead of trying to be skinny, I’ve decided to embrace my curves. I go to the gym to be healthy instead of slender. And I try to lose weight for the sake of saving my body some extra woe should I manage to get pregnant. My mother had gestational diabetes and preeclampsia when she was pregnant with me. Though I don’t believe she displayed these symptoms when pregnant with my younger sister, I still assume that I will probably have similar issues when and if I ever become pregnant myself. And for that reason, I do try to lose weight. However, I am also trying to embrace being ‘a woman of size.’ I bought Ragen Chastain’s book, Fat: The Owner’s Manual- Navigating a Thin-Obsessed World with Your Health, Happiness and Sense of Humor Intact. 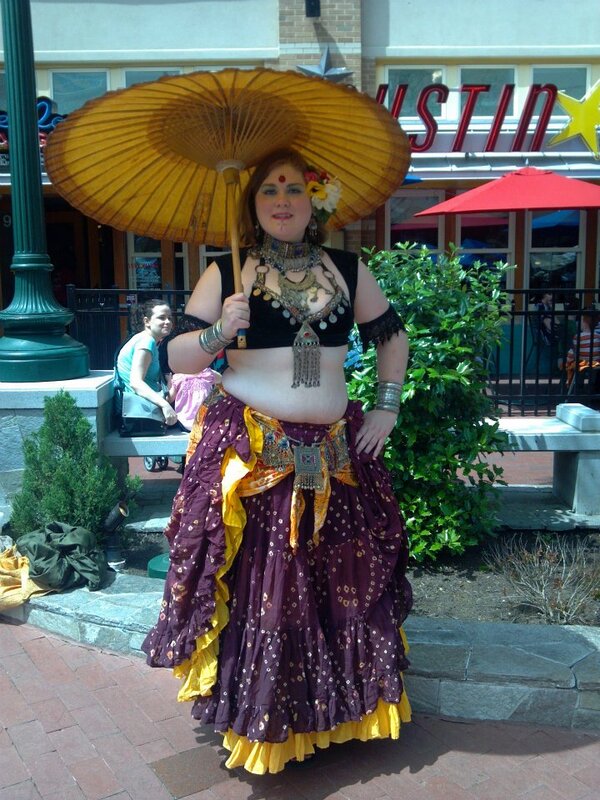 Ragen is amazing because not only is she obese (she prefers to call herself fat) but she’s also a dancer. And she’s a great one! She’s also the author of the blog, Dances with Fat, which I highly recommend you follow. So I’m done with dieting. Now I try to eat healthfully. And I’m done with weighing myself. I only ever get weighed at the doctor’s office. And when they break out the ‘thigh cuff’ to wrap around my arm to take my blood pressure, I try not to wince. I also try not to look at the scale when they weigh me. But for all this self-empowerment and telling myself that I’m fine with being fat, I still failed to embrace it in my last blog post. And I feel I should make up for that. So to rectify the situation, I’m uploading these photos. These are pictures of me enjoying the moment, not conscious of my weight as I perform whatever activity I am pursuing. There are rolls and curves and bulges, and I am trying not to care. This was taken at a cookout last year in which we employed a knock off ‘slip-n-slide.’ Yes, that’s a beer in my hand. Those are also my hips, belly and waist. Look at me, not even bothering with a proper swimsuit. Thanks much to my friend Christen Roberts Comer (who also knits like a fiend!) for the photograph. 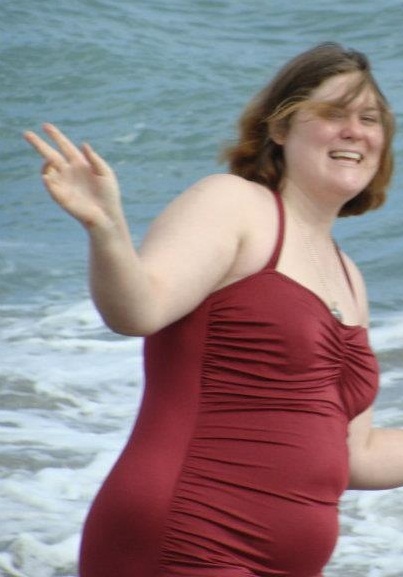 Here’s one of me in a proper bathing suit. Even with the Esther Williams inspired runching on the front of the suit, you can’t deny the the rolls. And THAT’S OKAY! And to bring this post full circle, here’s another shot of me from that same photo shoot. You can see my belly folds even as I try to cleverly disguise them with a mesh unitard. Most of the time, I really don’t care about my weight. And sometimes I’ll see a picture of me like this, and I cringe. But I shouldn’t. I should be proud. And with time, more effort and more honesty like I’ve shown in this post, I will be proud. My Mema always said, “I’d rather be fat and happy than skinny and hungry.” I’m way more comfortable with my size 20/22 body than I ever was with the size 10/12 one. I hear you and your Mema!! YES! I got your congrats and popped by to say hello and THIS is what I get! What a wonderful intro. You have won me over with your beer and slip and slide. And I have size 11 feet. So when we find ourselves a wee it tipsy and you have lost your shoes – you may borrow mine, friend. Great post. Great post. Off to read more. *squee* You’re already one of my favorite bloggers. Thanks for stopping by and making my Monday!